father when he was seven. The family moved to Detroit,Michigan in 1924. Jimmy left school in his teens and went to work as a warehouseman for Kroger grocery stores. It was there that he was initiated fully into labor activities. He became a committed trade activist, and in 1932 led fellow workers in a strike against the company. 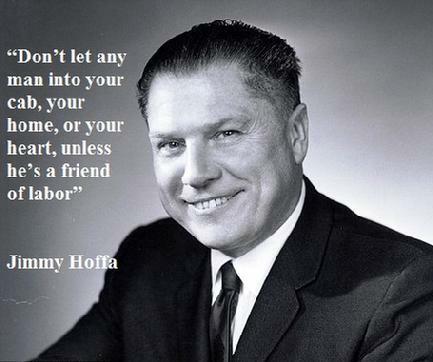 By 1933, Hoffa had risen to the position of business agent for local 299 in Detroit, and then was elected President of the local in 1937. He further developed his leadership abilities by forming the Michigan Conferenceof Teamsters in the early 1940s. He was a tireless organizer for the union, and champion of labor concerns. He even met his wife, Josephine, when she was on strike against the company where she worked. Jimmys natural skills and easy rapport with rank-and-file workers did not go unnoticed. In 1952, he was named a Vice President to the General Executive Board of the International Brotherhood of Teamsters, and in 1957 he was elected General President at the national convention. 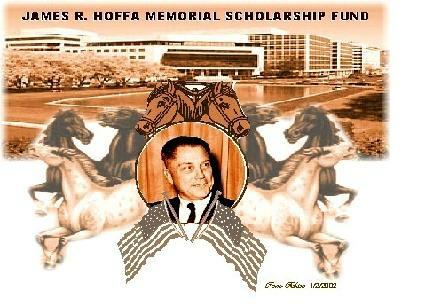 Hoffa was very popular with union members, and was again elected General President in 1961. He developed a well earned reputation among his peers as a tough and effective bargainer, and worked hard to expand the number of working men and women who were protected by union contracts. In 1964, he negotiated the first National Master Freight Agreement, a feat that had been declared virtually impossible by many. This became the crowning ahievement of his career, and this success aided him in revitalizing and expanding the union even further. He served as General President for 14 years and increased membership to more than two million workers in that time. 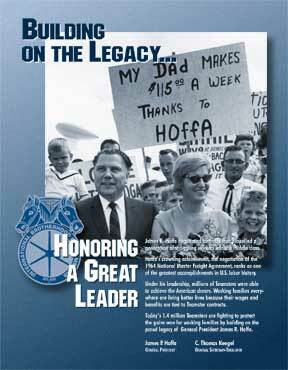 Jimmy Hoffa never became immune to the needs of working families, even when he reached the pinnacle of union leadership. He often would take on members problems and concerns that others in similar positions would consider small potatoes or staff work. This trait, plus his genuine camaraderie with union members and their families, as well as his ceaseless work on behalf of labors here and abroad elicited unabashed feelings of respect, admiration, and loyalty from the rank-and-file that is still alive today.